This week we’ve some fantastic Just Cause 2 news for PlayStation players and not just that it’s now only two months until release! Nope, this week we can reveal that – exclusive to the PS3 – players will be able to capture their favourite moments of mayhem and destruction in Just Cause 2 using a unique, in-built video capture function. Capture, view and share via YouTube your craziest stunts, your most over-the-top grapple kills or your moments of sheer jaw-dropping awesomeness that leave you and your audience lost for words! If ever there was a game screaming out for video capture, it was Just Cause 2. The freedom given by the game to mess around in the over 1000Km² of game world gives you the power to pull-off some of the most incredible Hollywood-style stunts ever seen in a videogame. Whether surfing commercial airliners, freefalling from exploding jet fighters into fortified enemy bases or ‘grapple jumping’ from helicopter to helicopter (you’ve got to try this! 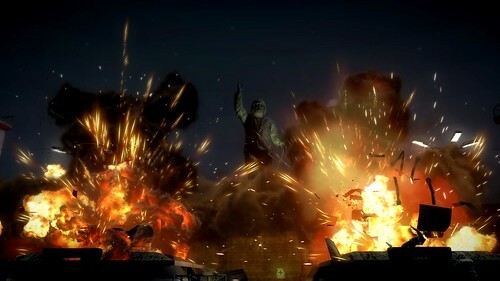 ), Just Cause 2 has moments you’ll want to watch again and again. Capturing your chaos couldn’t be simpler. Once activated, the game will continuously capture the last 30 seconds of gameplay, whatever you’re doing. If you’ve caused great pain to someone on the island by grappling them to the back of a passing passenger plane and watched as they’ve been yanked off their feet and whisked through the sky screaming to their impending aerial doom, then we’ve got it covered. Simply hit the pause menu and you can save it to your hard drive or upload it to your YouTube Channel for the world to see. But if you fancy getting a little more creative and 30 seconds is simply not enough, we’ve got that covered too! We’ve added a 10 minute capture option which, once activated, will start recording an extended clip for those moments you know are going to end in chaos. So, if you’ve just found yourself a military helicopter with undercarriage-mounted missiles and mini-guns and a government oil refinery, packed with fuel silos, gas storage stations and pipelines just ready to go ‘boom’… well, you know just what to do!